25 mins drive from the CBD, you cross the ranges of the Brisbane State Forest and Samford’s green rural palette beckons you to enjoy a slower rhythm. we are delighted to be invited back to play! We'll be heading back to Robina on Queensland's Gold Coast for another night of sweet music making, fine food, wine and the lovely hospitality from the good folk at Spaghetti and Jazz! Mr & Mrs G’s are having live music again and we’re delighted to have been invited back to play! Aaah…. Sunday afternoon by the Brisbane river…. Mr & Mrs G’s are having live music and we’re delighted to have been invited back to play! Aaah…. Sunday afternoon with the sweetest vibe by the Brisbane river…. Brisbane Unplugged Gigs is such a special place for us… from one of our earliest ever gigs to our very first CD launch - every time we’ve played at this music lovers club has been a night to remember! We’ll be doing something special for this one as it’s our 10th year as OoA!! due to last minute family health business…. we are hoping we’ll have another chance to play next year! Holi Sandhya commemorates the Indian festival of Holi at twilight (Sandhya) in celebration of the victory of “good over evil”. Yatra brings together the passion and energy of various artists to produce dance and music that engages the heart and mind. At Holi Sandhya Yatra will take you through a snippet of the ‘journey of the world’ since the beginning of time, depicting stories across various time periods with music and dance, which celebrate diversity and multiculturalism in recognition of the migration that has happened across the globe, forever in time. From classical to contemporary dance and music, Holi Sandhya promises to be a spectacular evening of Rang (colour), Raag (melody) and Ras (emotions). DATE saver - ha ha get it!! BYO tipple picnic…. and bring a chair, it’s a festival of sharing a summer evening with friends. Wander the Potter’s grounds & gallery. Join the events on one or both nights with a music program ranging over Blues, Jazz and Folk. Old time favourites & new grooves, with a different program each night. We have been invited back to play at a very special function at this delightful restaurant and you are welcome to come along too - there are a few tables available for bookings! OoA are excited to be playing again for Music in the Mountains at the beautiful Hotel Blue in Katoomba. We'll be heading back to Robina on Queensland's Gold Coast for one last night in 2018 for sweet music making, fine food, wine and the lovely hospitality from the good folk at Spaghetti and Jazz! Join us on the last day of exhibition for the Harmony 2 ‘Shine’ Artists' Party!! There will be gifts, prize collection, off the wall sales and live music by Out Of Abingdon! Tina is one of the artists exhibiting! We are happy to have been asked to perform again this year for the annual Brisbane Ionian Club Christmas Lunch! 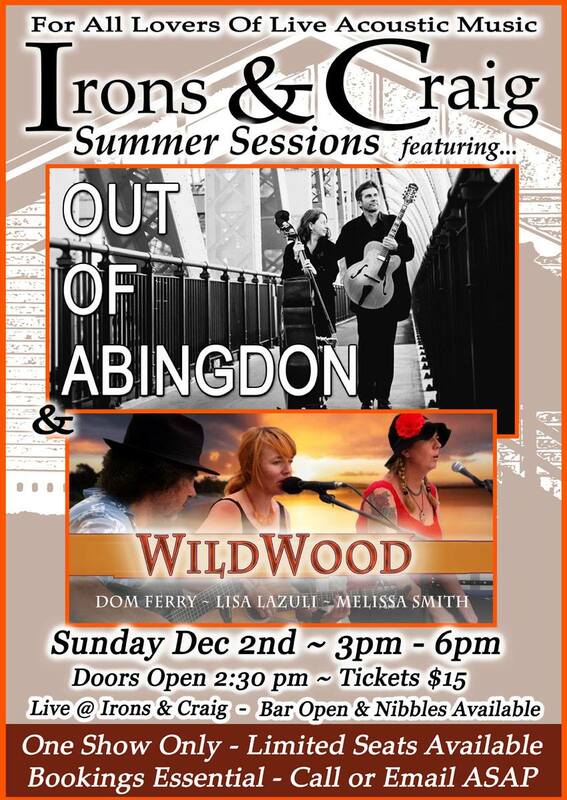 for all lovers of live acoustic music! We are soooo excited to play at Blue Tongue Berries - an amazing off grid solar and wind powered organic farm! We had such a lovely gig at Open Studio, Northcote in January this year we decided to stop in and do it again in November! It's $10/8 at the door! We're super proud to have been invited to play at the 2018 Bendigo Blues & Roots Festival .... Whoo HOO! The finale night of the BRISBANE FESTIVAL always end with a bang! and Medley is a wonderfully delicious 'secret' riverside location to watch all the action go down ... with a little OoA to serenade you. A lovely last minute invitation sees us playing at this weekend's Maleny Music Festival! What a treat to play at the Inaugural House Concert of our musical friends living on this beautiful bay Island! Entry from 11:00am SUNDAY 26th August 2018 with ShapeShifter and Friends kicking off the afternoon at 12:00 midday.